Nareera is the 471st highest place in Ireland. Park on the roadside at V91700 54569 A and follow the Beara Way on a well marked track through the woods for 4.5 kms before the climb up the back of the valley under the Sugarloaf. The Beara way is shown by a series of yellow posts up to and past Lough Tobernavaha. Just past the lake the track begins to climb again slightly , as you approach Logh Keel turn north and climb the rounded face of Nareera to the summit. This picture is taken from the west end of Lough Keel, around 400m SW of Nareeva. All the complicated land west of Sugarloaf is apparently simplified into a ridge from this viewpoint. To the left is Nareeva, to the centre is Toberavanaha (west and probably higher) top, then the east top of Toberavanaha while peeping around the side of Toberavanaha is Sugarloaf hill far to the right. Hopefully someone will retake this picture on a day where some sun brings out the texture and shape of the land better. Well its taken 7 years Simon but looky here. 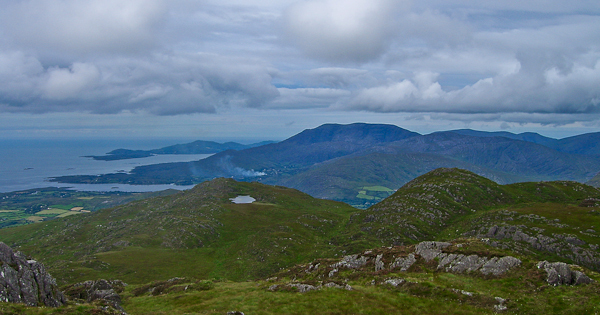 Thats Lough Keel to the left. 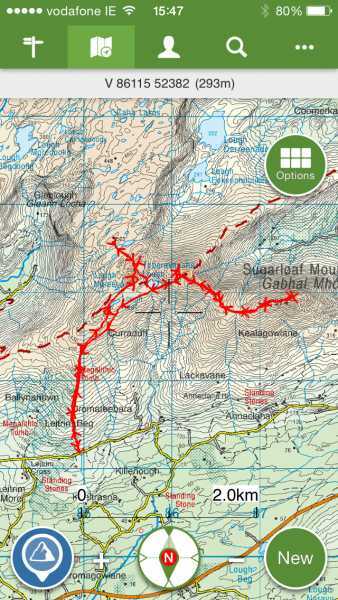 Getting to Nareera has no doubt gotten easier as the Beara way has now been diverted through the mountain pass past Lough Tobernavanaha. All around you though is red sandstone with slate bands thrown up , folded, bent , broken and fissured during the Amorican period 300 million years ago. Taking an east-west direction they ripple slowly down ending in promontories and a splatter of islands. Looking north you are invited by a vast wilderness of bog, rock and lake not tainted by the hand of man. To the south west the tip of Bear island siting off Castletownbere pokes its head around the corner. The deep-water harbour here was, up to the 19th century, much used by smugglers. From 1922 to 1938,called Berehaven, it was one of three Treaty ports in the Irish Free State, sovereign bases maintained by the Royal Navy.